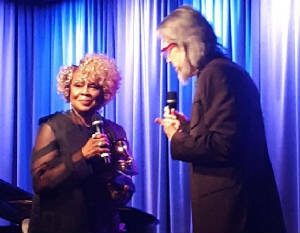 Grammy Award winning Thelma Houston was honored at the Grammy Museum's "An Evening with Thelma Houston" where she performed and received a replacement Grammy Award for one she won in February, 1977 that was destroyed in an earthquake. The evening also included an intimate interview with the songstress by Grammy Museum Executive Director Scott Goldman and the audience, which was a full house. Thelma Houston's career started at a time when she was a wife and mother. She joined a Gospel group called Art Reynolds Singers. Raised in Long Beach, California Thelma was soon signed to Dunhill Records as a solo artist. She debuted in 1969 with "Sunshower" produced, arranged and composed by Jimmy Webb. Jimmy Webb is a Songwriters Hall of Famer and was the first to every win a Grammy Award for songwriting. When talking about working with Jimmy at Dunhill Records Thelma compares him to other producers who made her sing the songs over and over, she said, "Jimmy never did that with me. They would say, ‘Let's do it again.' I would say, ‘Do it again!?' Jimmy would say, ‘Ok that's it. How you like it, feels good. Feels good to me, let's move on." Jimmy Webb hit songs include the 5th Dimension's "Up, Up and Away," "By the Time I get to Phoenix" and "MacArthur Park" - to name a few. "I moved to Los Angeles," said the Mississippi native. "...And I started to realize who he was. You know Jimmy would drive to Long Beach to pick me up because I wasn't driving, to come up here to his house to practice our songs." In 1971 Houston signed to Motown Records; however her singles were not too successful until 1974 when her single reached Billboard Charts and she received a nomination for her vocals. It wasn't until 1977 that she received her first #1 Motown hit with "Don't Leave Me This Way," a remake of the Harold Melvin and the Blue Notes song. It was Suzanne DePasse, Berry Gordy's (Motown Records) top level executive, who gave Thelma the song to record. Suzanne heard the song on the radio and thought Thelma could do a better job with it. Thelma did just that because it earned her a #1 Billboard position and a Grammy Award win. Thelma told the audience that she wasn't even at the Grammy Awards to receive it. When she received a replacement Grammy Award from Grammy Museum's Scott Goldman she said, "I've had a career that has stretched almost 50 years." Houston, no relations to Whitney Houston, was inducted into the Dance Music Hall of Fame in New York City, honored as an "Apollo Legend" and has performed at The Vatican. She has also performed her hit song "Don't Leave Me This Way" on "American Idol" and "America's Got Talent." The Grammy Museum is a non-profit and was established in 2008 as a partnership with the Recording Academy and AEG to cultivate a greater understanding of the history and significance of music. In 2017 it integrated the Grammy Foundation to broaden its reach in music education and preservation. SYNDICATED COLUMN: Eunice Moseley, has an estimated weekly readership of over ¼ million with The Pulse of Entertainment. She is also a Public Relations Strategist and Business Management Consultant at Freelance Associates, and is Promotions Director (at-large) for The Baltimore Times. www.ThePulseofEntertainment.com. EVENT: "Uplifting Minds II," a Free Entertainment Conference held annually in Baltimore (Saturday April 20, 2019), in partnership with Security Square Mall and The Baltimore Times and Los Angeles (October/TBD). Offering an Entertainment Business panel and a talent showcase and competition (vocal, songwriting, dance and acting) with over $15,000 valued in prizes for each category. www.UpliftingMinds2.com.